A cheap, generic vaccine has been shown to improve blood glucose levels in people with Type 1 diabetes for years, according to the results of a new study. Published June 21 in the journal npj Vaccines, the study included 52 participants with longstanding diabetes who were randomly assigned to either a treatment group or a control group. Members of the treatment group received two doses of the bacillus Calmette-Guérin (BCG) vaccine — which has long been used worldwide to protect against tuberculosis (TB) — four weeks apart. Three years later, everyone in the group showed reductions in HbA1c (a measure of long-term blood glucose control) to near-normal levels, and this improvement continued for five additional years of follow-up. These results demonstrate “the potential to stably lower blood sugars to near-normal levels with a safe vaccine, even in patients with longstanding disease,” says Denise Faustman, MD, PhD, senior author of the study and director of the Massachusetts General Hospital (MGH) Immunobiology Laboratory. The study’s results show that among participants who received the vaccine, HbA1c dropped by more than 10 percent after three years, and by more than 18 percent after four years. This reduction was largely sustained over the next four years, with an average HbA1c level of 6.65 percent in the treatment group after eight years, compared with 7.22 percent in the control group. While this study did not track participants’ insulin use and was not designed to see if they could stop taking insulin, researchers reported seeing no evidence of increased insulin use in the group that received the vaccine. In fact, they noted several instances of participants significantly reducing or stopping insulin use for short periods of time. The next phase of this trial, currently in progress, will closely monitor insulin use in all participants, according to an MGH press release. 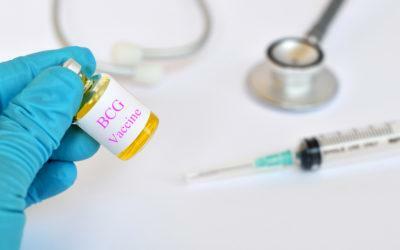 The BCG vaccine had no effect on naturally produced insulin in members of the treatment group, the researchers found. Instead of being driven by restored insulin production or reduced insulin resistance, the treatment group’s improved HbA1c levels were due to improved glucose metabolism. Specifically, white blood cells in these participants took in more glucose when blood glucose levels were higher — and used less glucose when levels were lower. This effect demonstrates the potential for a new way to more safely bring down blood glucose levels, according to Faustman. “The problem with insulin is that it continues to work even when your blood sugar is low,” she notes. Since hypoglycemia (low blood glucose) can be dangerous and even deadly, she says, it’s usually not advisable to try to achieve normal blood glucose levels using insulin alone. Since it can lower blood glucose without requiring more insulin, the BCG vaccine could prove to be effective in all forms of diabetes, the researchers write — including Type 2 diabetes. But Faustman stresses that more trials of BCG are key to understanding its potential for diabetes-related uses. “More global studies, as well as advancing our own studies, are central,” she says. Two leading organizations in diabetes research and education — the American Diabetes Association (ADA) and JDRF — issued a joint statement in response to the study’s results and the attention it has received. The statement points out that the number of participants involved in the study was small — especially before it was expanded — and that the results don’t represent a dramatic reduction in HbA1c. Other limitations of the study, according to the statement, include that it didn’t track insulin use or the standard of care followed by participants, and that it didn’t explore alternative explanations for lowered HbA1c, such as natural variability over time.